The Laboratoire de Géophysique reported that explosive volcanic activity may have occurred at Fonualei volcano during late September. On 27, 28, and 30 September numerous short T waves were received by the French Polynesian Seismic Network. The preliminary location of the seismicity was determined to be near the Tonga archipelago at 18.18°S (well constrained) and 174°W (not as well constrained). The hydro-acoustic activity was interpreted to be volcanic and explosive and could not be related to seismic activity at the Tonga Trench. According to the Laboratoire de Géophysique, the hydro-acoustic source could be near Fonualei volcano. In February 1974 a ship's captain reported that Fonualei was "emitting small quantities of steam, foam, and rocks all around the crater" (CSLP Card 1802). Large fluctuations in fumarolic activity were observed by geologists in July 1979 (SEAN 04:12). 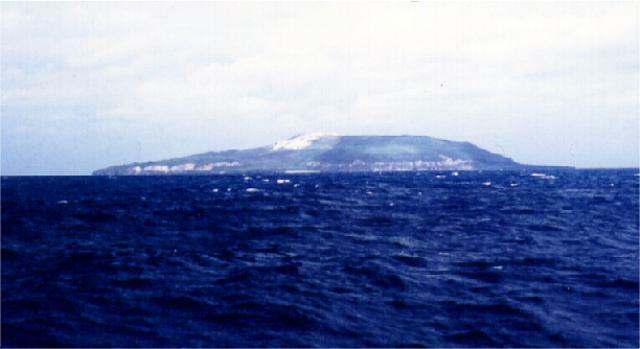 On 19 August 2000, Jeff and Raine Williams, aboard the S/Y Gryphon, passed Fonualei enroute from Tonga to Wallis Island. They noted that the lower part of the island was covered with lush tropical vegetation, but the upper parts were scarred brown and gray, and steam was venting from the top of the island. Along the coast were rugged volcanic cliffs and black sand beaches. Information Contacts: Jeff and Raine Williams, P.O. Box 729, Funkstown, MD 21734, USA. Captain J. Jenkins of the S.S. Union South Pacific reported by radio to Nuku`Alofa, Tonga, the following observation: "Fonualei Island, Tonga, position 18°01' S, 174°19' W (18.02°S, 174.32°W) was emitting small quantities of steam, foam, and rocks all around the crater at 1900 GMT, 15 February 1974." Tom Simkin indicates that this activity could be a normal geothermal process, but the fact that rocks were being thrown out suggests that the activity is probably significant. Information Contacts: J. Jenkins, S.S. Union South Pacific, Union Steamship Co. of New Zealand; T. Simkin, Smithsonian Institution. Geologists aboard the RV Bulikula inspected the volcanoes along the Tonga Arc between 3 and 21 July. . . . Fonualei . . . was emitting steam when viewed . . . in mid-July. The small island of Fonualei (~2 km diameter) contains a fumarolically active crater breached to the SE with a fresh lava flow extending to the sea and forming a rugged shoreline. Steep, inward-facing scarps mark the rim of a partially exposed caldera. Blocky lava flows fill much of the northern caldera moat and reach the sea to the north and east. In contrast to the andesitic and basaltic rocks of other islands of the Tonga arc, Fonualei lavas are of dominantly dacitic composition. Eruptions have been recorded since 1791, with the largest taking place in June 1846, when explosive eruptions produced large pumice rafts, ashfall damaged crops on the island of Vava'u (70 km SSE), and ash was reported by vessels up to 950 km distant. In 1939 explosive and effusive activity occurred from summit and flank vents, and water spouts were reported 1.6 km SE of the island. Brodie J W, 1970. Notes on the volcanic activity at Fonualei Tonga. New Zeal J Geol Geophys, 13: 30-38. Spennemann D H R, 2003. The June 1846 eruption of Fonualei volcano, Tonga, an historical analysis. Charles Sturt Univ, The Johnstone Centre Rpt, 196: 1-30. There is no Deformation History data available for Fonualei. There is no Emissions History data available for Fonualei. Seen from the NE, Fonualei volcano has an upturned saucer profile. The small, less than 2-km-wide island of Fonualei contains a fumarolically active crater, which is breached to the SW with a fresh lava flow extending to the sea and forming a rugged shoreline. Blocky lava flows from a central pyroclastic cone have reached the sea through notches in the rim of a small caldera. Eruptions at Fonualei have been recorded since 1791, with the two largest taking place in October 1846 and July 1847. The following 46 samples associated with this volcano can be found in the Smithsonian's NMNH Department of Mineral Sciences collections, and may be availble for research (contact the Rock and Ore Collections Manager). Catalog number links will open a window with more information. Large Eruptions of Fonualei Information about large Quaternary eruptions (VEI >= 4) is cataloged in the Large Magnitude Explosive Volcanic Eruptions (LaMEVE) database of the Volcano Global Risk Identification and Analysis Project (VOGRIPA).